This cranial nerves quiz will test your ability to know the cranial nerves in order from I to XII (cranial nerves 1 to 12). In your Anatomy & Physiology class or other health related classes, you will be required to know the order, function, and location of the cranial nerves. In this quiz and video (below), I have tried to make learning the cranial nerves easy and fun. This cranial nerves practice exam will help you prepare for your class lecture exam and future exams. The cranial nerves are essential for the function of our ability to swallow, form facial expressions, feel facial sensations, speak, taste, hear, and much more. There are 12 pairs of cranial nerves that are located in the brain via the apertures in our skull. After you take the quiz below, the page will refresh and you will be able to see what you right/wrong with an answer explanation. Be sure to check out our other Anatomy & Physiology quizzes. This cranial nerves exam will test your knowledge on all the cranial nerves that you will have to know for an exam in Anatomy & Physiology. 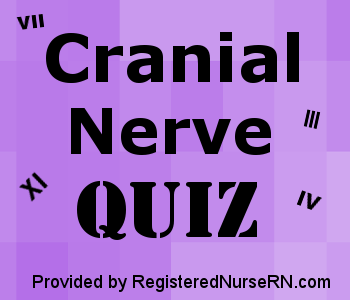 This cranial nerves quiz will ask you about the function and name of each nerve.